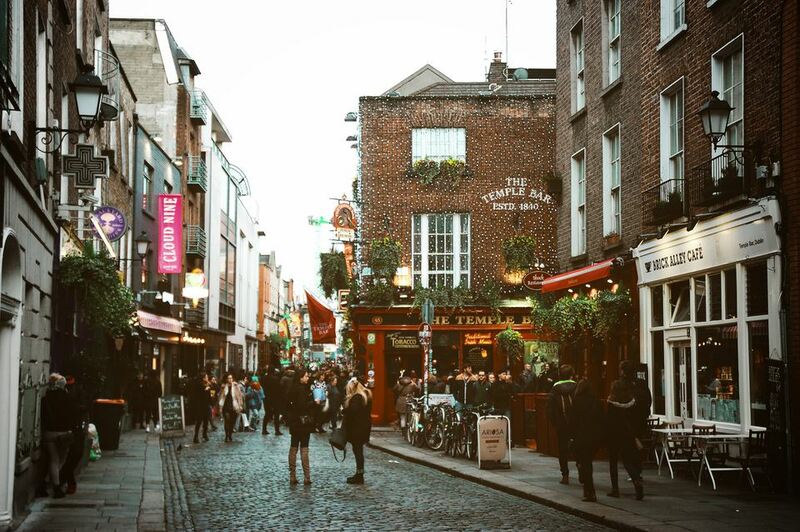 Full of cozy pubs and pretty cobblestone streets, there are countless romantic date spots in Dublin. Choosing a place to set the mood in the Irish capital simply depends on whether you plan to woo your date by day or by night. Charm them with strolls through the center or even a quick jaunt to the sea—all of these 15 dreamy Dublin spots are sure to impress your sweetheart. With more than two miles of pathways for hand-holding, St. Stephen’s Green is one of Dublin’s best free date spots. Pack a picnic for a romantic meal under the trees, or simply wander through the park after window shopping on Grafton Street. If you get caught up in the Irish weather, you can cozy up under the Victorian-style gazebos until the rain passes. Farmleigh is an Edwardian mansion tucked away in Phoenix Park. The lovely estate once belonged to Arthur Guinness’ great-grandson, Edward, who purchased it when he married his cousin Adelaide. It stayed in the Guinness family until 1999, when it was bought by the Irish government and is often used to host official state visits. It is now possible to tour this eclectic manor, which also has an art gallery and a working farm. The whole place is a sweet date spot, but the most romantic corner of all is the Boathouse Restaurant, where you can sit on the deck for a coffee or wine overlooking Farmleigh’s manmade lake. Want an excuse to cozy up over a drink? Be sure to take your date to the Dawson Lounge—also known as Dublin’s smallest pub. The intimate pub only has a few seats in its tiny underground bar, which means you have no choice but to snuggle up over a few pints. The Ha’Penny Bridge is one of Dublin’s most recognizable sights​ and the most romantic way to cross the River Liffey. Stroll under the wrought iron arches and stop to gaze out at the water and listen to the buskers that come to the bridge to play music. Unfortunately, love locks are no longer allowed on the bridge because the weight of the romantic tokens was weighing down the historic structure. But if you are looking to keep the loving vibe going, keep walking to Temple Bar. A trip to the movies is always a solid date night plan, but make the movie experience more special by catching a flick at Denzille Cinema. The tiny movie theater only has 30 seats and you can even rent it out for a private viewing—which might very well win an award for most romantic Dublin date. Learning how to pull a perfect pint of Ireland’s favorite beer is a fun couple’s activity, but even if you have already visited the Guinness Factory, you can still head up to the Gravity Bar for a drink. The famous Irish stout is always available, but so is a longer drink menu. The elevated bar at the top of the Guinness Factory is sure to impress thanks to its sweeping 360-degree views of Dublin. Follow in the footsteps of Romantic writers like Oliver Wilde who once roamed the green lawns of Trinity College. The gothic architecture is enough to inspire daydreams, but bonus points to those who come armed with a book of poetry to read out loud to their one true love. What could be more romantic than a trip to see the patron saint of love? Head for Whitefriar Street Carmelite Church, which looks fairly bland from the outside but actually contains the shrine of Saint Valentine. Yes, the man responsible for Valentine's Day is actually a Dubliner by adoption. Special masses for lovers are said on the saint's feast day (which is February 14th, naturally), but the church is open to visitors every day. Co-founded by poet and playwright W.B. Yeats, the Abbey Theatre is the national theater of Ireland. The classic theater is the best place to catch a dramatic Irish performance. The theater stages contemporary plays as well as classic dramas – all for the low early bird price of 10 euros a ticket. That means you should have enough cash leftover to have dinner before the show, thus pulling off a seriously romantic cultural date night. Already explored all the romantic spots in Dublin city proper? Then head for the bay and take a leisurely stroll out to the South Wall lighthouse. Officially called the Poolbeg Lighthouse, it sits 2.5 miles from shore but is connected by a large pathway. For easier access, and good pubs and restaurants nearby, you might also plan a day out at Howth Harbour Lighthouse—though you will find less alone time and bigger crowds there. Though Iveagh Garden is in the center of Dublin, a stone’s throw from St. Stephen’s Green, the small park off Harcourt Street remains fairly undiscovered. The gardens have romantic pathways, a small hedge maze, and even a miniature waterfall which all create a lovely backdrop for a free daytime date in the city. Take a step back in time with a romantic walk down Moore Street. The Dublin lane is one of the few in the city that has remained virtually unchanged since the 1800s. The characteristic open-air market makes for a quaint backdrop for a good old-fashioned date and is the perfect place to pick up ingredients to whip up a home cooked meal for your other half. Stately St. Patrick's Cathedral may not have the relics of Saint Valentine, but Ireland's national cathedral does have a "'til death do us part" love story. The church is the final resting place of Irish author Jonathan Swift and Stella, whom he called the "most beautiful, graceful and agreeable young woman in London." Stella's (whose real name was Esther Johnson) was the friend and muse of the Gulliver's Travels author. The rest of their relationship is just speculation, but it must have been fairly close for them to wind up buried side-by-side for all eternity. The age-old love story makes for a romantic stop in Dublin. Dublin Castle is a bit too political to inspire any real romance, but luckily nearby Malahide Castle makes for a much better date destination. Admire the turrets and take a tour of the castle grounds hand-in-hand by day, then stick around to catch an evening concert. The musical events are regularly staged on the castle grounds, making for a truly unique Dublin date. A bouquet of flowers always helps to start a date off on the right foot, but the problem with these cut blooms is that they fade within a few days. Surprise your date with a trip to the National Botanic Gardens instead. The greenhouses and garden paths are brimming with blossoms that can brighten up even the grayest Dublin day.